El Rancho Robles is the gateway to your next adventure! With close proximity to some of the best biking, hiking, golfing, caving, bird watching, site seeing, horseback riding, and off road trails in the state, you can explore the beauty of the desert with El Rancho Robles as your home base. Perhaps you are more interested in visiting local attractions like the Biosphere, state parks and other Arizona tourist destinations. Our close proximity to these means you can spend more time enjoying these and less time driving to get there. Whatever your taste for adventure, make El Rancho Robles the first stop on your adventure. Oracle State Park, Center for Environmental Education– A 4,000 acre wildlife refuge located on the northern foothills of the Santa Catalina Mountains north of Tucson. The park offers 15 miles of interconnecting loop trails through oak-grassland overlooking the San Pedro River Valley. A four-mile section of the Arizona Trail transects the park, and is a multi-use trail enjoyed by hikers, equestrians and mountain bikers. The park was once the Kannally family ranch, and the Mediterranean-style Kannally Ranch House is listed on the National Register of Historic Places. The park is open on Saturdays and Sundays, 8am to 5pm, from October through April. Admission is $7 per vehicle. Annual passes are sold in the park gift shop. Biosphere 2- Tours of the interior building including the underground lung are offered daily and located within 10 mins of the ranch. The tour provides an opportunity to appreciate and discuss science in a friendly, informal setting. This one-of-a-kind facility sits on a ridge at a cool elevation of nearly 4000 feet and is surrounded by a magnificent natural desert preserve. 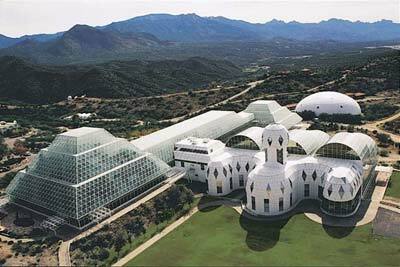 Experience the remarkable Biosphere 2 which Time Life Books recently named one of the 50 must see “Wonders of the World”. See why visitors from around the globe journey here for this unique adventure not found anywhere else. Your experience will be like no other! Tours daily from 9:30 a.m. – 4:00 p.m. and depart every 30-45 minutes subject to change. It is not necessary to book a reservation for groups with 20 people or less- upon arrival you will be assigned to the next available general tour.